In choosing breeding stock it is particularly important to us that the horses we choose are healthy and match the Sorraia type as closely as possible. Unfortunately, it is difficult to find really good Sorraia mares. 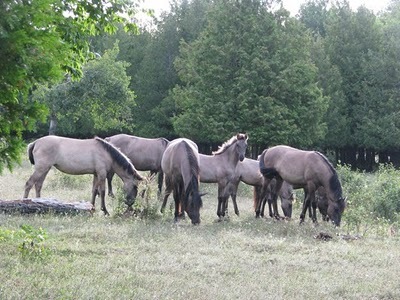 There are a very limited number of brood mares, and naturally breeders are rarely willing to part with those with good typical characteristics. Maybe introducing new blood is unavoidable if we want to save this species. Suitable horses for this can be found among the Mustangs in North America and also among Iberian horses. Interestingly, research has shown that some Mustangs not only have an astonishingly similar phenotype (external appearance), but also the same genotype (genetic make-up) as Sorraias, meaning they have Sorraia blood. A few breeders have already produced very promising foals with strong Sorraia characteristics from Sorraia type Mustangs and pure Sorraias. This is also one of our aims in the coming years.